Back on the 15th of August I got the great news that I had been listed as finalist in the Gurgle Blogger Awards for Dad bloggers. To say I was over the moon would have been an understatement, unfortunately on reading who the other 4 finalists were my heart sank. Anyway why did my heart sink? Not because I thought I didn’t stand a chance against them, no, god forbid my competitive nature wouldn’t allow that! No the reason simply is I know the other four. We all talk together on twitter, I follow all their blogs and unfortunately they are all really nice guys and they all write from great blogs, all from different perspectives. Now the rest of the guys have written about the awards in different ways, and at the end I will post the links to their blogs, first though I want to tell you why I would love you to vote for me. So why should you give me your vote? The Gurgles are probably the most important recognition from my standpoint simply because of what and who the gurgles are. Gurgle is all about pregnancy, birth and babies, so the synergy between my work and them is obvious. 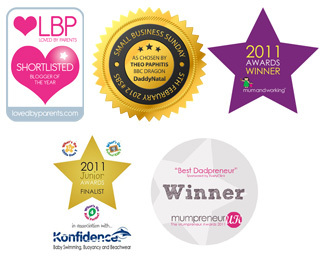 It is run by Mothercare, probably the leading supplier of all things baby in the UK. I have no doubt that winning the Gurgle award would raise the profile of DaddyNatal no end and open doors to me that are currently closed or just are creeping open. I am looking for sponsors to take DaddyNatal on the road and provide free at point of delivery classes for expectant dads. I want to train more dads through our FEDANT accredited training program so that we can support as many dads as possible. All of this I believe will become one step closer to being fulfilled if I can win this award. Now the rest have all been pretty subdued in pitching for votes, it has all be very subtle. Well Ok Daddy Diaries went for the humble WOW! DDB is nominated for a gurgle and a not so humble “The life and times of a house husband” has blogged asking for votes with his piece called Im a nice bloke vote for me! Daddacool Wrote this generous piece Gurgles 2011 and then Himupnorth went and did this! Recognition , magnanimous or what? So sorry, I am going to be up front and just tell you, I really want to win this award and I would love for my partner who runs Bump Birth and Beyond doing amazing work with mums to win her category. So please vote for us HERE and also have a look at some other great blogs that are also finalists. If you do give me your vote then a heartfelt thank you. Oh and one last thing I also get to meet Myleene Klass !! This entry was posted in DaddyNatal, Discussions, News and tagged Antenatal Bonding, babies, baby, birth, blog, bloggers, Breastfeeding, DaddyNatal, Dads, Dads Role, Expectant dads, father, Gurgle, Gurgle Awards, Gurgles 2011, Men, mother, Mothercare, Myleene Klass, NCT, New dad, parents, Unborn Baby by Dean. Bookmark the permalink. Have given yourself and your partner a little vote 🙂 Good luck with it all and please let me know if you would ever like me to do a guest post for you on Breastfeeding? I could always do it from my partners point of view and his thoughts on it all?